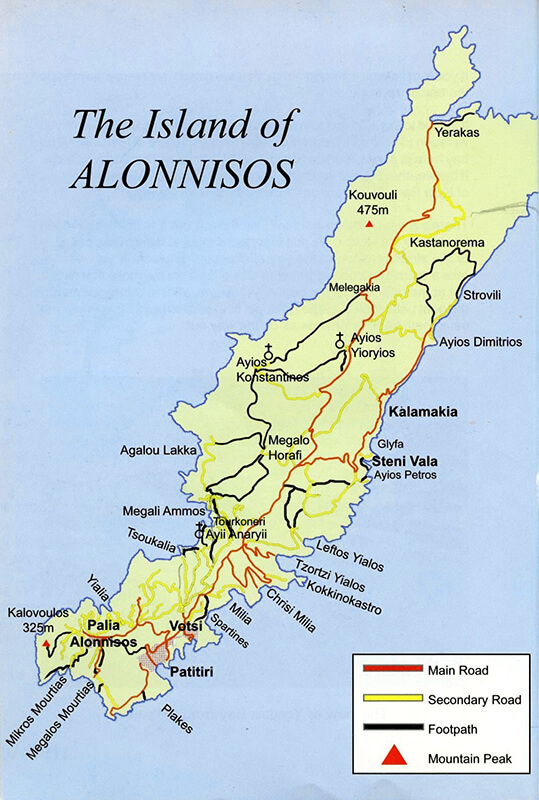 We welcome you to Hiking Alonnisos on the hilly and fertile Greek island of Alonnisos. Apart from the beauty of the landscape, the island also has a widespread network of old transport routes from the era where mules and donkeys where the only means of transport. Most of these paths are kept clean by the EOT (Greek Tourist Organization) to ease the way for hikers. The routes that we have chosen in our book cover a big area of the island and offer a wide variety of both natural and cultural points of interest. You visit the historical old village of the island, the small fishing villages with their colourful fishing boats and turquoise-green water; you pass from great views to deep ravines and beaches with crystal-clear water. You walk along footpaths and earth roads as much as possible but also a little on asphalt. The landscape on Alonnisos is hilly and on most tours it goes up and down but in most cases with an easy gradient. At the start of your trip you walk up the old donkey track to the Old Village, Palia Alonnsos situated 200 meters above sea level. You can here visit the Post- Byzantine churches and the fortification area called Kastro. Refreshments can be enjoyed at one of the cafes before the trip continues to the beach of Megalos Mourtias. Here you can swim in the turquoise coloured, clear water and also have a meal or a drink. The way back to Patitiri goes through pinewoods and olive groves a little above the coast.